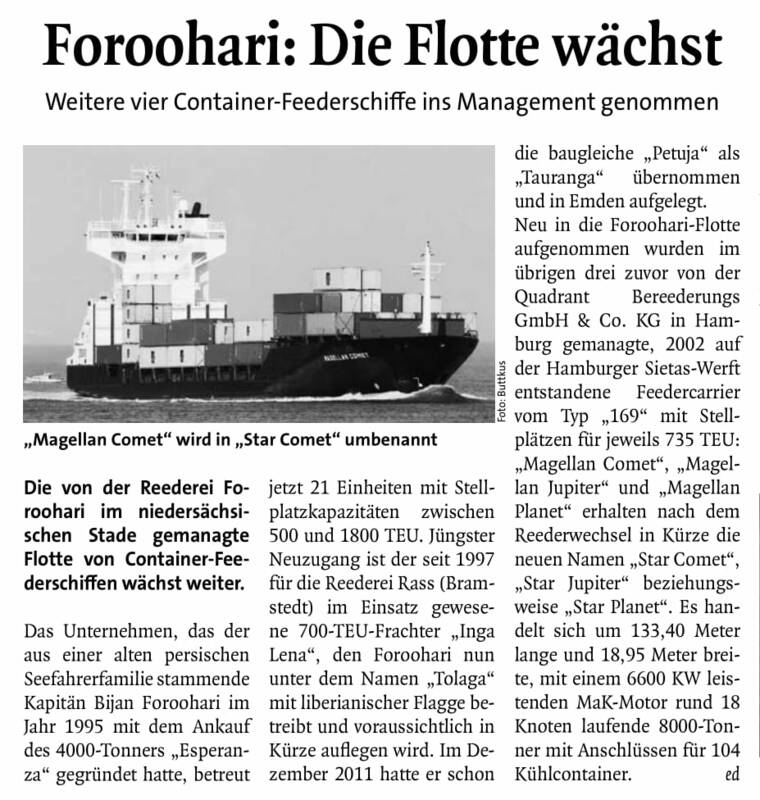 Incremental for Foroohari-Fleet. 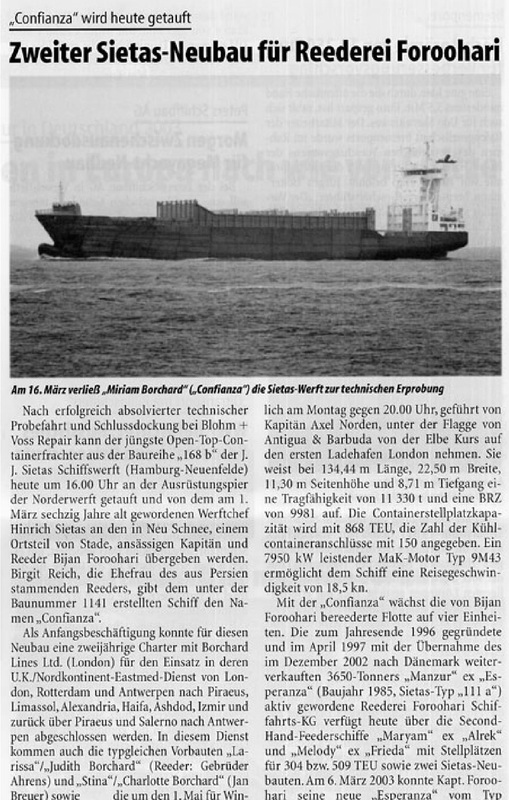 Taking over ten year old MPP-Carrier “Beluga F” – Series from Döhle. 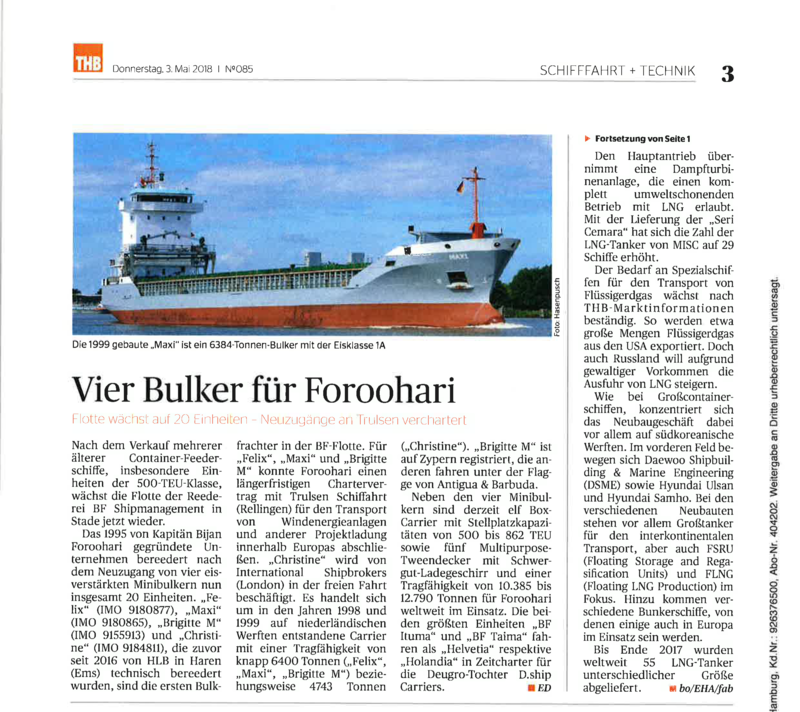 Four Bulker for Foroohari. Fleet grows up to 20 Units – Trulsen chartered accession. X-Press Feeders hired “BF Caroda”. 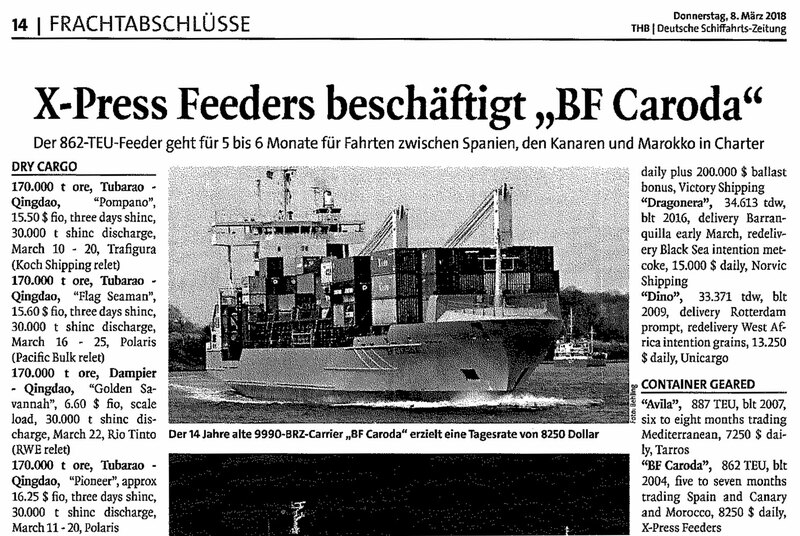 The 862-TEU-Feeder goes into charter for 5-6 months between Spain, Canaries and Morocco. No ship will come. The labor union Ver.di and a Stader shipping company meeting at labor court. Three MPP-Carrier for Foroohari. 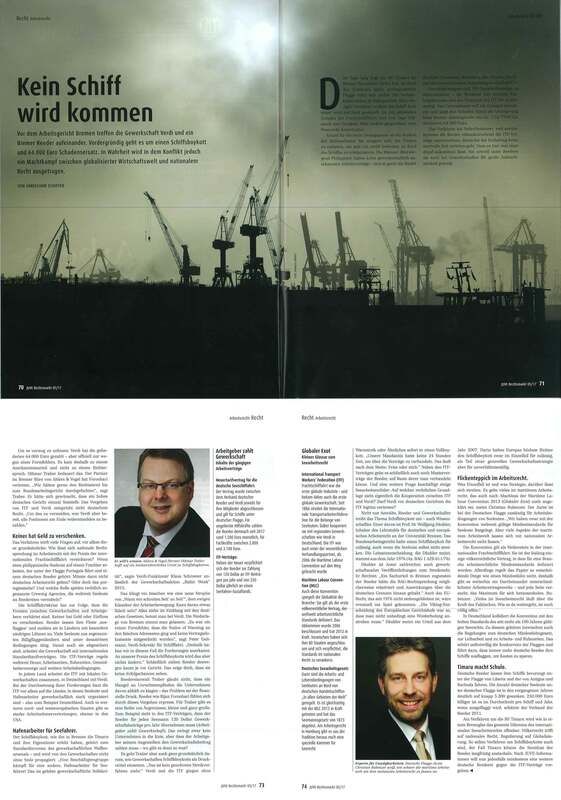 Ship owner from Stade takes over Carrier from Eckhoff and Winter – MPP-Division grows up to six untis. Unlawful vessel boycott. Labor union ver.di has to pay compensation to ship owner. 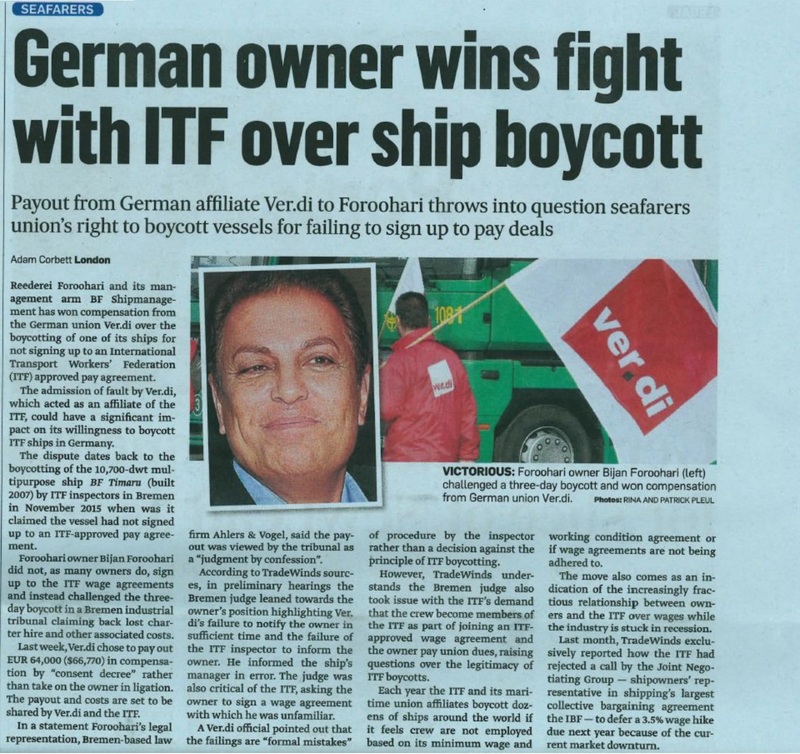 German owner wins fight with ITF over ship boycott. 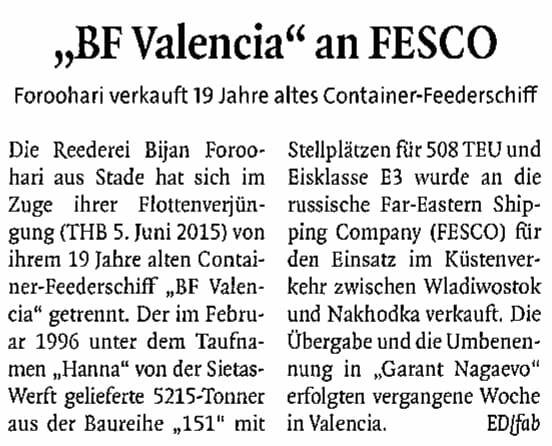 “BF Valencia” sold to FESCO. 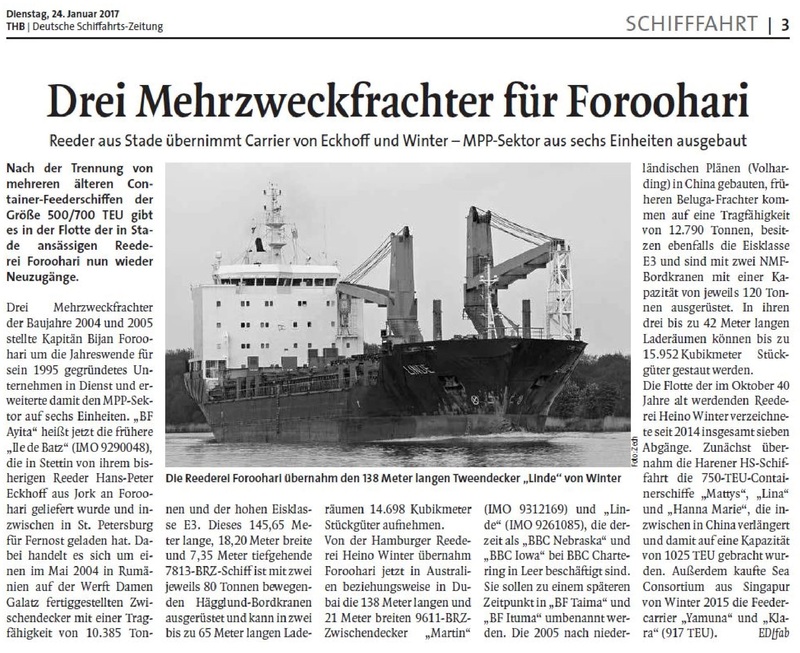 Foroohari sells 19 year old container vessel. Three MPP-Carrier for Foroohari. 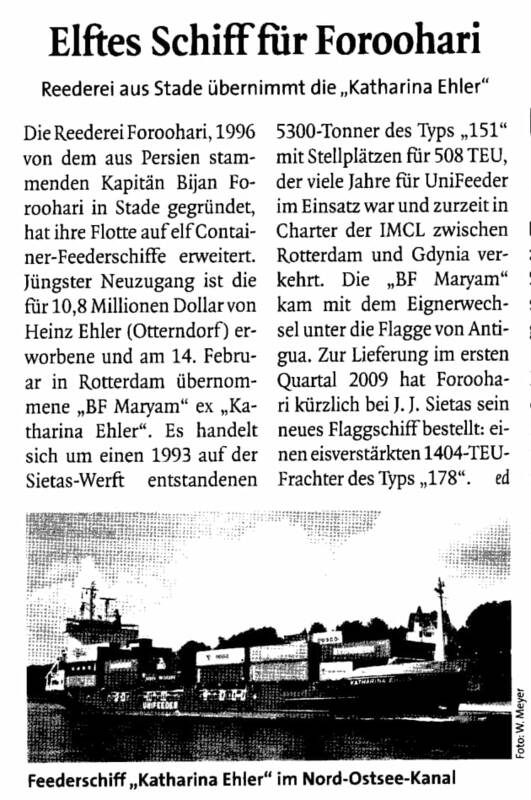 Stader ship owner takes over “OS Bodrum”, “Team Spirit”, “BF Caloosa”- Fleet should grow up to 30 units. Finally Stade gets his own maritime gateway. The Stadersand harbor installation was refurbished. The 1794-Carrier “BF Ipanema” (Build Year 2009) achieved a daily income of USD 7,200. 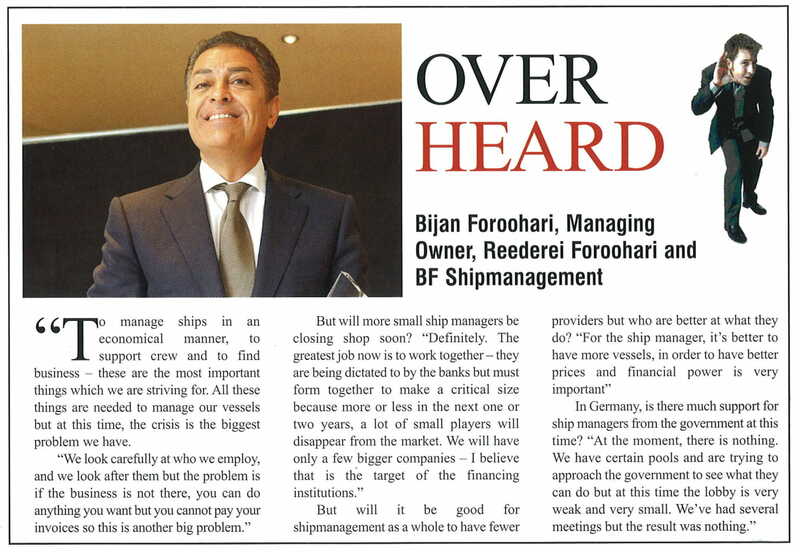 Interview: Bijan Foroohari, Managing Owner, Reederei Foroohari and BF Shipmanagement. 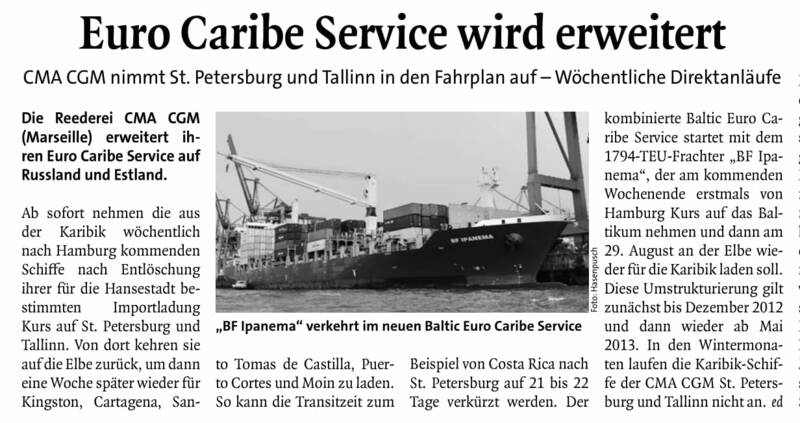 Euro Caribe Service is extended. Foroohari: The fleet is growing. Four more container vessel under management. Taken over 20th container vessel. 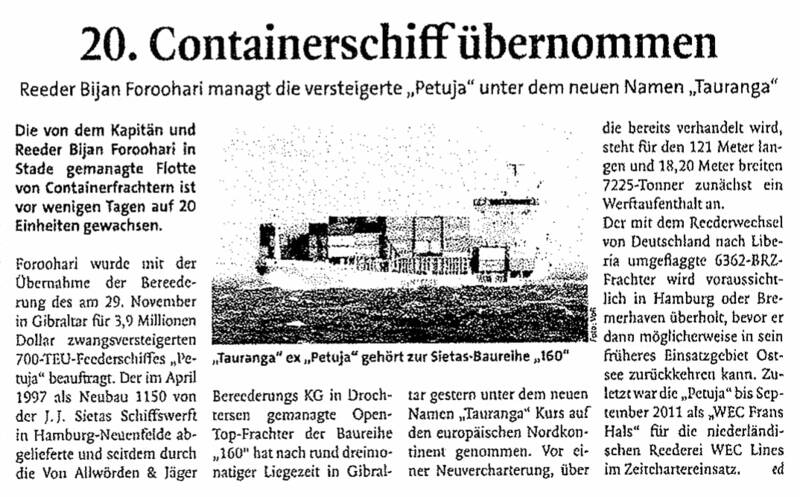 Ship owner Bijan Foroohari managed the auctioned “Petuja” under the new name “Tauranga”. 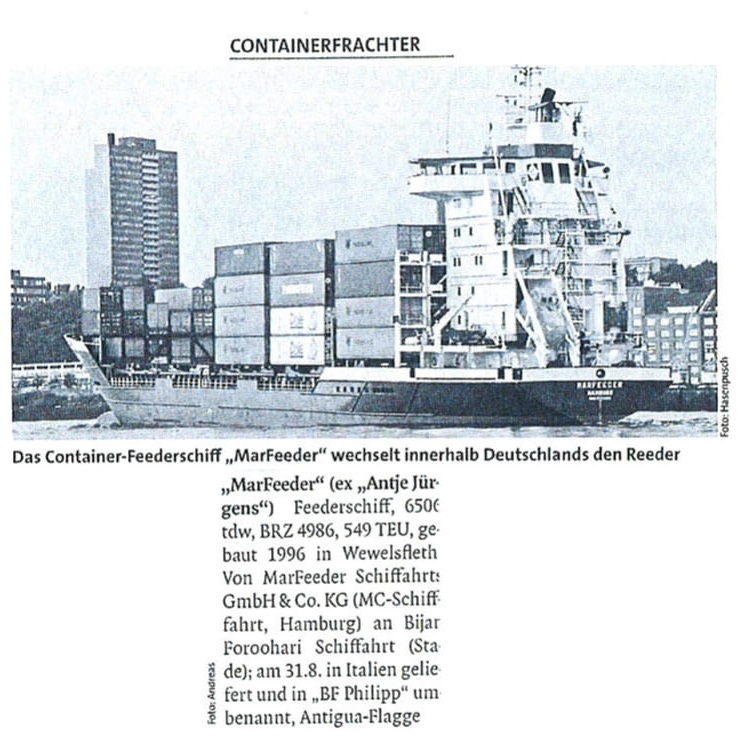 Container vessel “Marfeeder” changed ship owner within gemany. Pure dramatic at storm near Gibraltar. Stader ship owner takes care of 70 castaways. Ship owners hope for improvement. Cautious optimism in the branch despite huge problems – government assistance demanded. 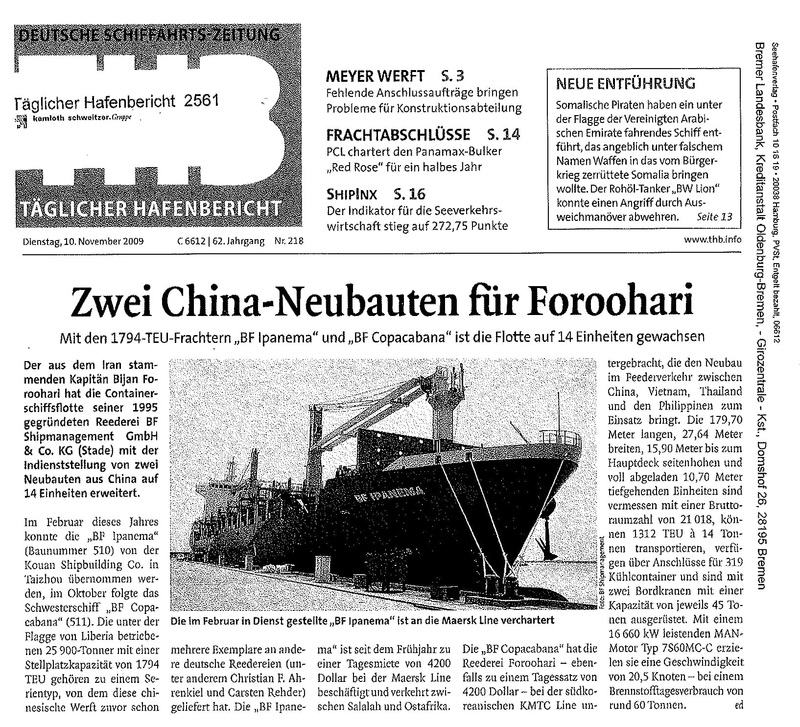 Two new china-constructions for Foroohari. Considering “BF Ipanema” and “BF Cobacabana”, the fleet grows up to 14 units. 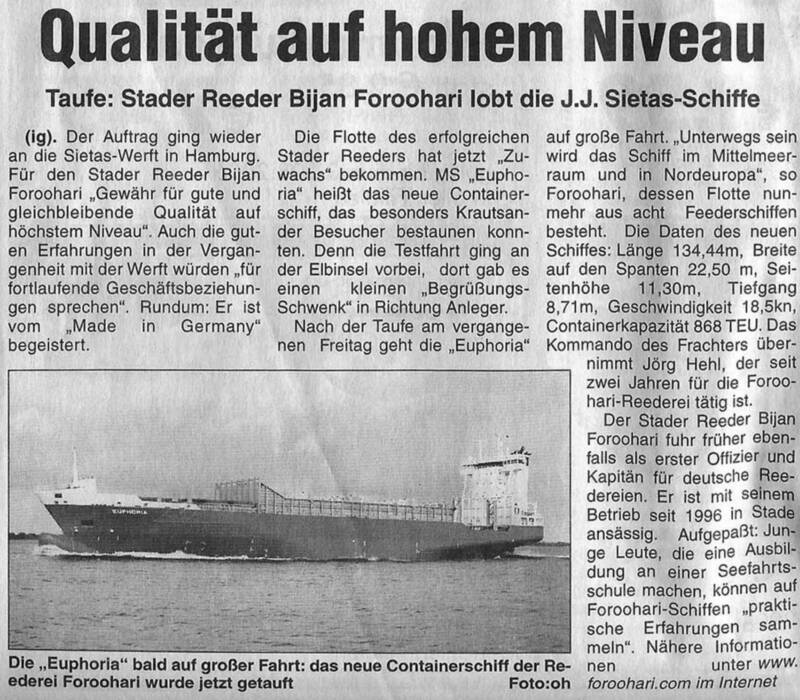 The Stader located shipping company Foroohari will put two new constracted 1,312 TEU container vessels as “BF Ipanema” and “BF Cobacabana” into service. Container vessels facing rough sea. 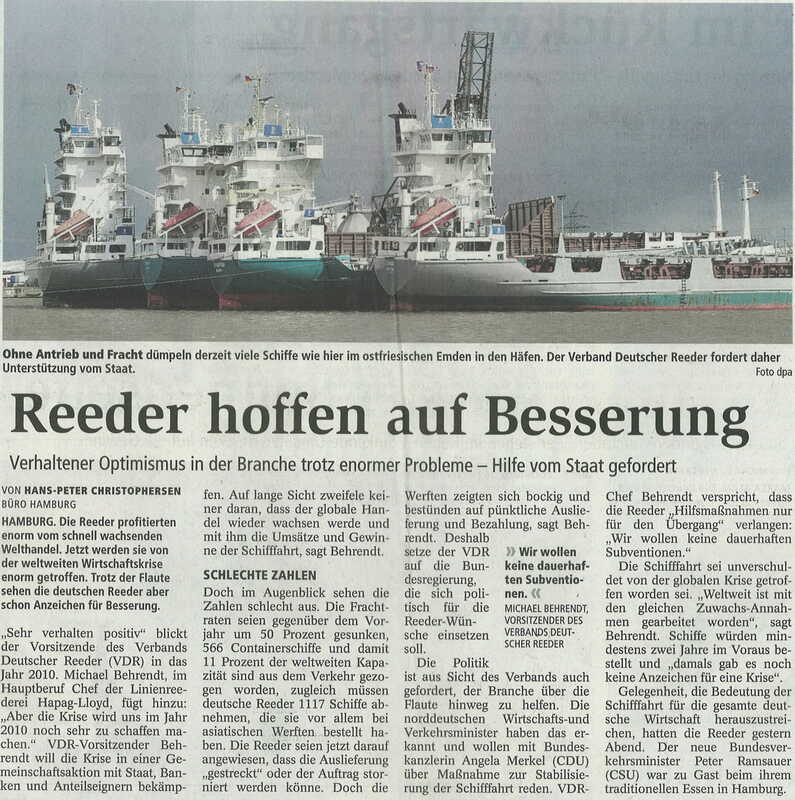 Ship owners from Stade hopping for improvement over the next year – freight rates drope over 70%. 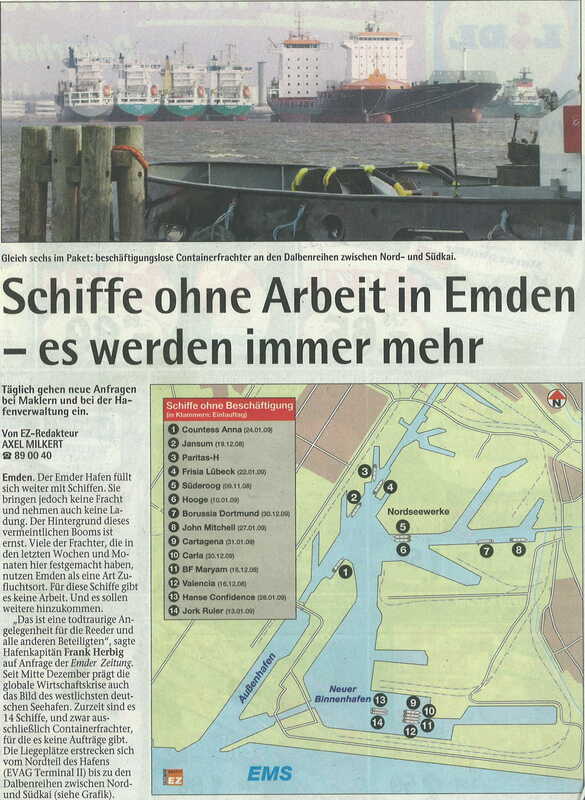 Vessels without employment in Emden – and counting. Daily increase of requests to broker and port authority. Ten vessels without employment waiting at Emder port. They are a visible sign, that the economic crises has reached shipping. 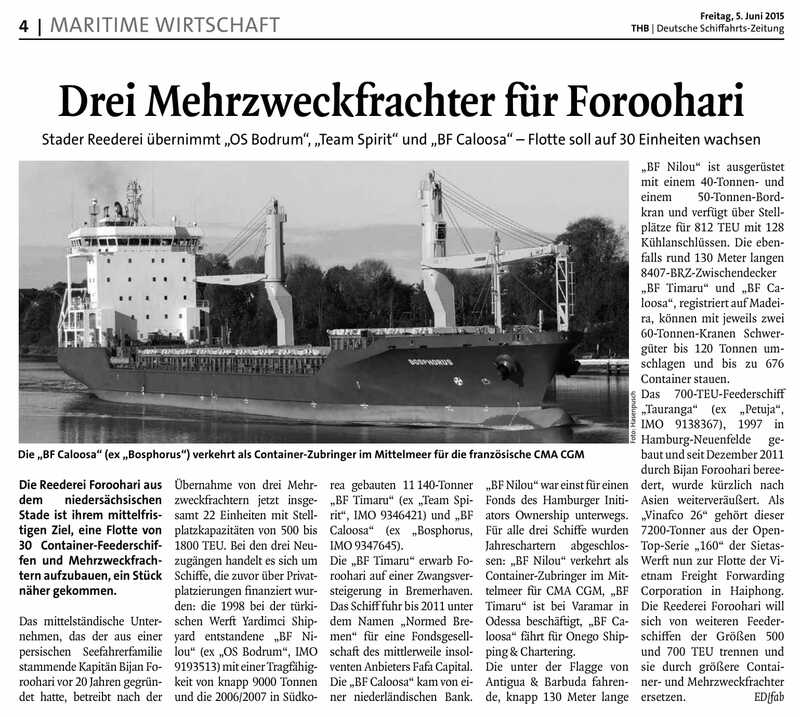 Eleventh vessel for Foroohari. 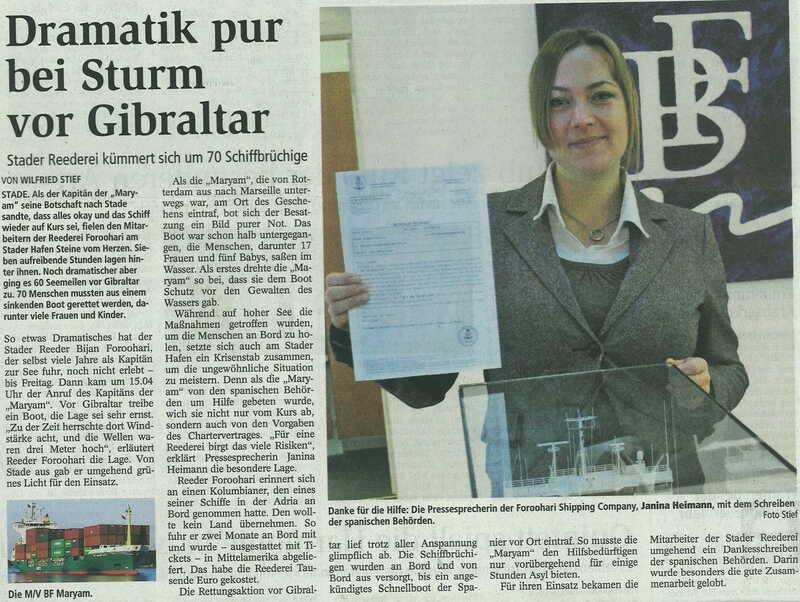 Ship owner from Stade takes over “Katharina Ehler”. Expand to Hamburg. 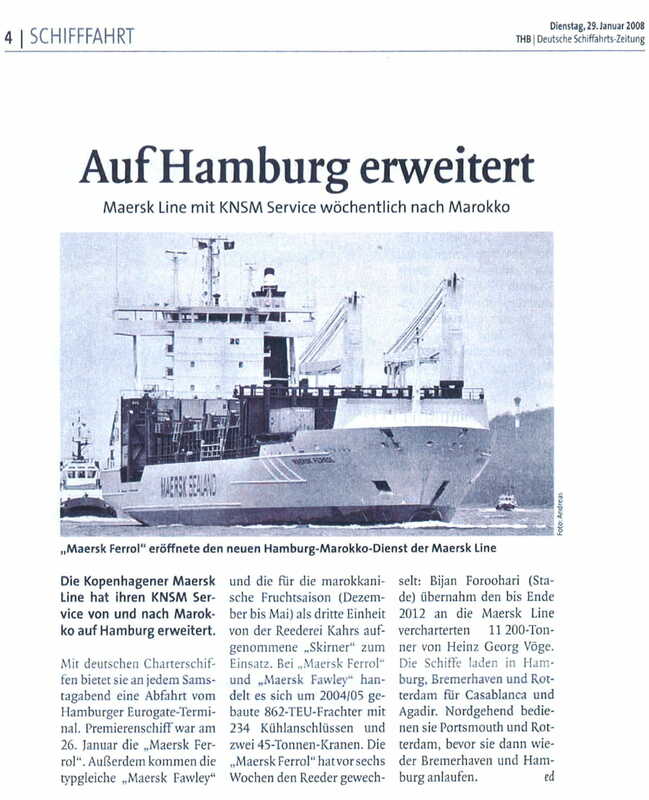 Maersk Line with KNSM weekly service to morocco. High level quality. Naming: Stader Reeder Bijan Foroohari praises J.J. Sietas-Vessels. 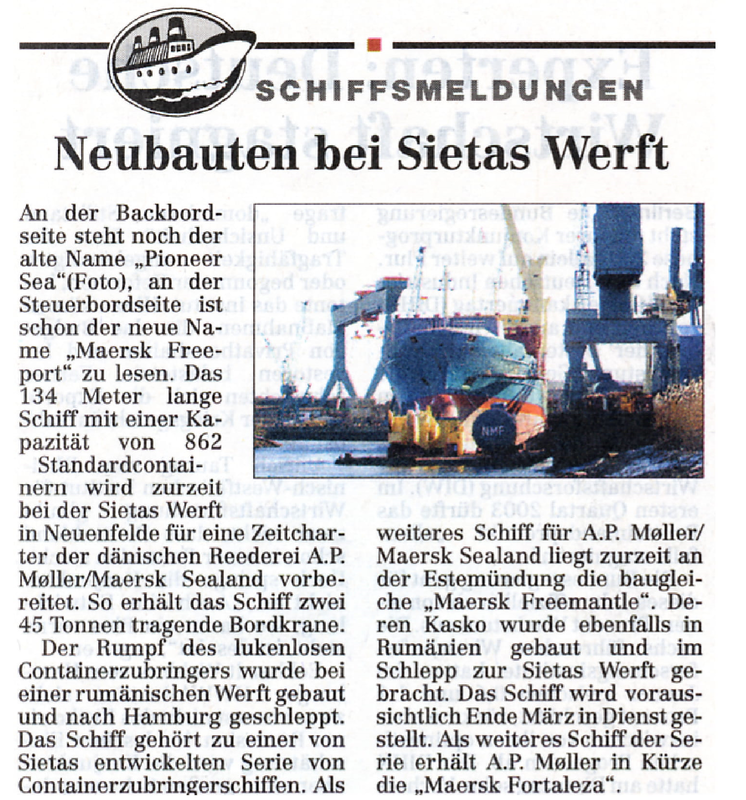 Stader ship owner swears on Sietas-Vessels. 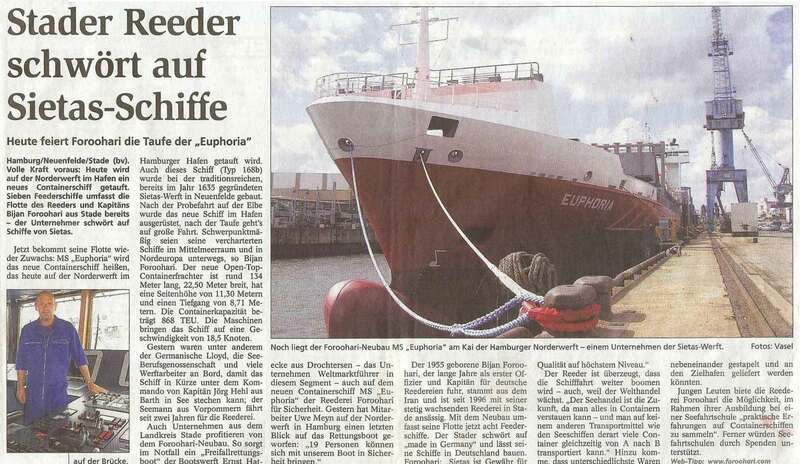 Foroohari celebrates the christening of “Euphoria” today. “Confianza” will be christining today. 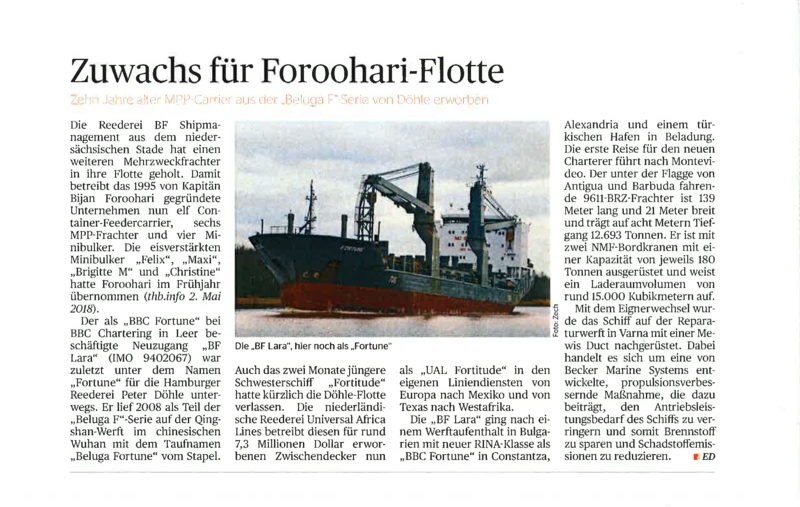 Second new Sietas-Vessel for ship owner Foroohari. Christining of a vessel at Sietas on the Norderwerft on monday. New Sietas-Vessel for Captain Bijan Foroohari. 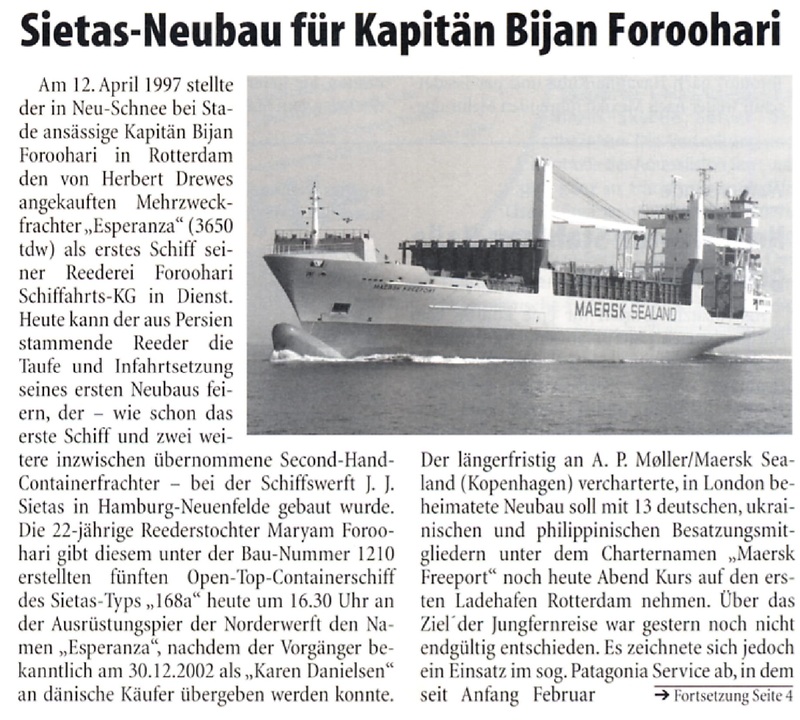 On April 12th 1997 Captain Bijan Foroohari puts the MPP-Carrier “Esperanza” into service as the first ship of his company. 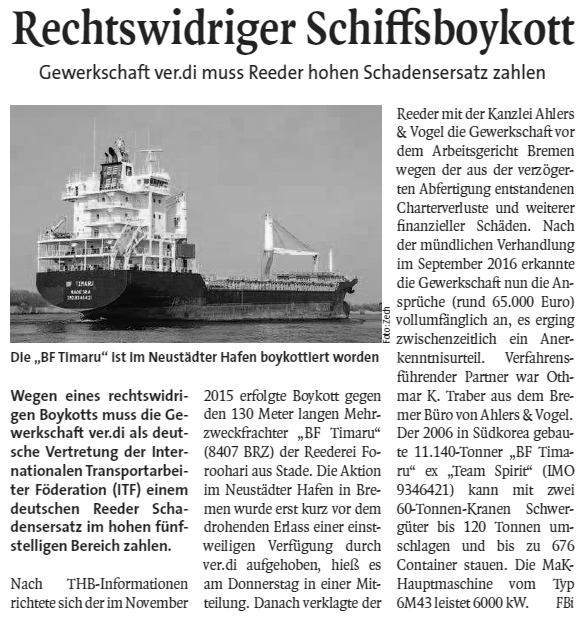 Stader ship owner trust on Sietas. 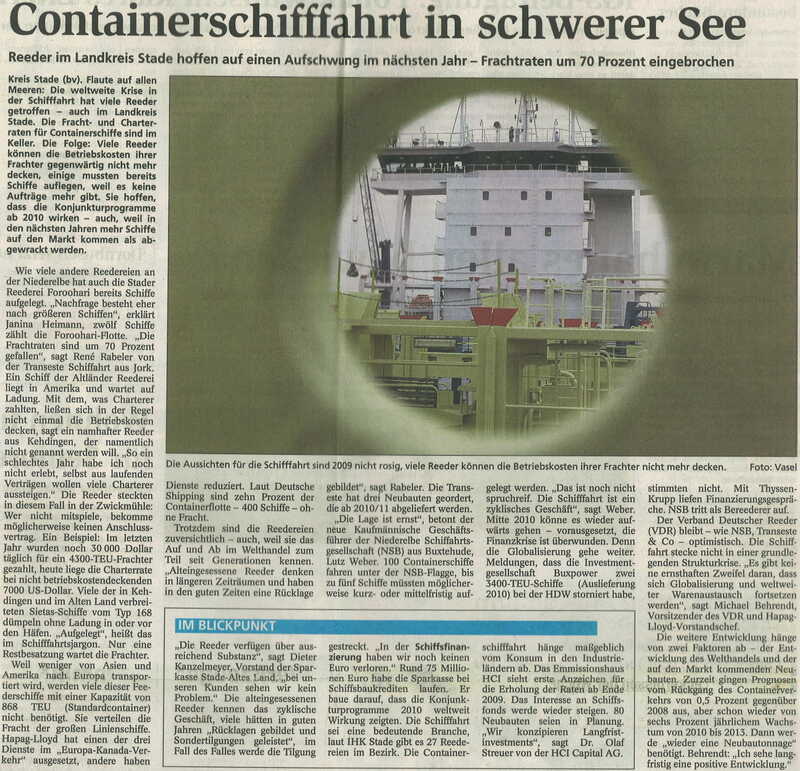 Today: Marjam Foroohari christens new container vessel in Hamburg. Vessel ahoy. New constructions at Sietas shipyard. 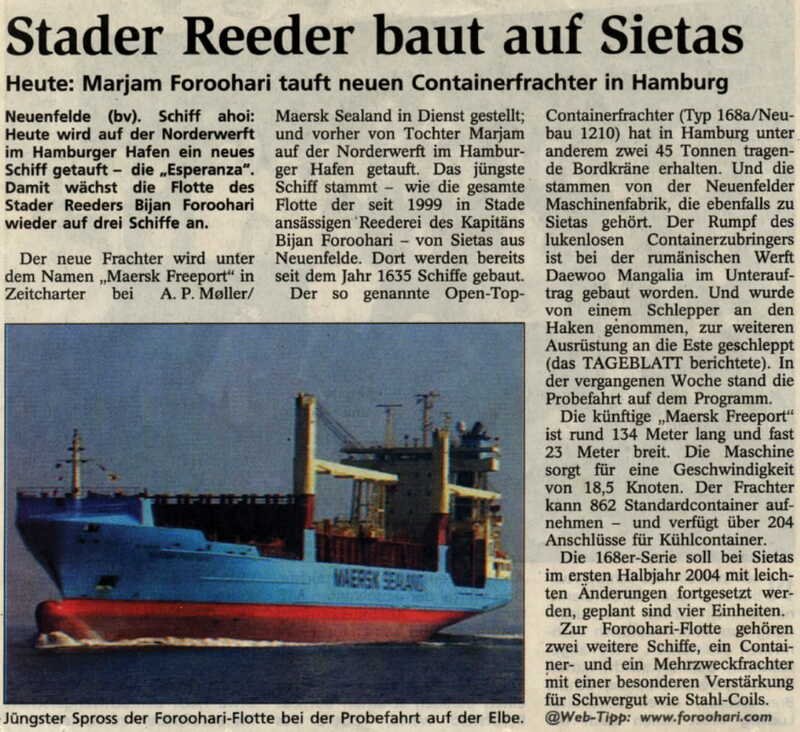 On port side still stands the old name “Pioneer Sea”, on starboard side you can already see the new name “Maersk Freeport”. 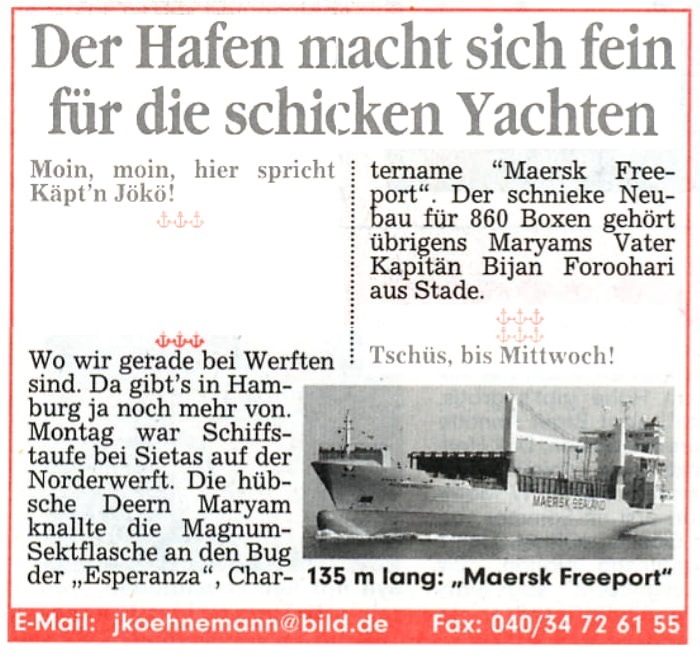 As “Esperanza” to ship owner Bijan Foroohari. The formerly “Pioneer Sea” will be christened as “Esperanza”. “Alrek” and “Frieda” purchased. Stader ship owner expand fleet. New owner for “Esperanza”. 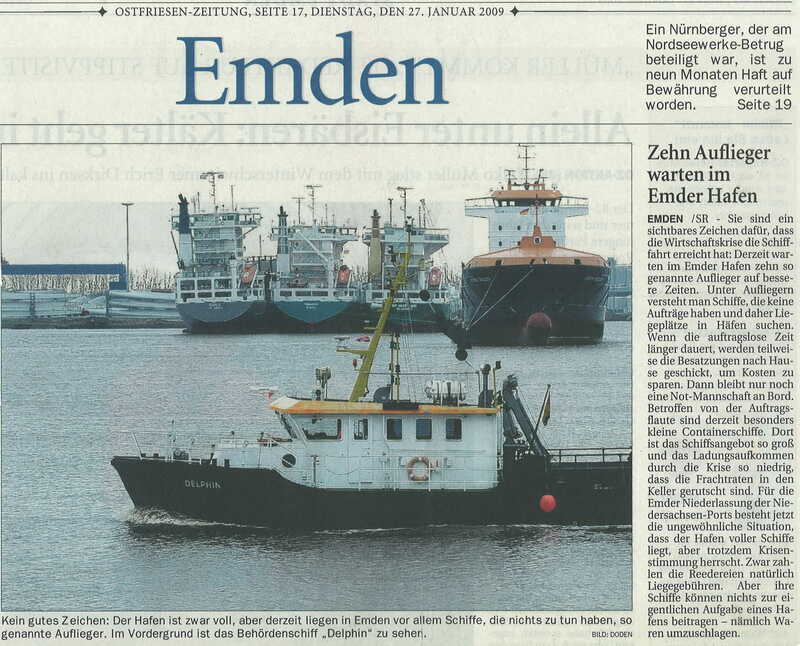 Captain and ship owner Herbert Drewes sold his MPP-Carrier “Esperanza”, which was built in 1985 at the Sietas shipyard.